Have you wondered why some groups work better than others? The answer is simple: teamwork. By building a more cohesive team, many issues simply fade away. Over the years, companies face a lot of challenges internally. Some organizations fall into routines, which can breed complacency, “a feeling of being satisfied with how things are and not wanting to try to make them better.” Some companies fail to foster an environment that encourages collaboration, a problem further exacerbated when employees quarrel and fail to get along. Some companies struggle to properly motivate employees, which can lead to dissatisfaction and inferior work. And so on. Fortunately, these issues are all treatable and, in most cases, the solution lies in building a more cohesive team. Have you ever wondered why some teams – some groups – just work better than others? The answer is quite simple: teamwork. By building a more cohesive team, many of these issues simply fade away. This can be done in a few different ways. Establish Guidelines: Do you have an employee handbook? If so, is its importance emphasized to your employees? It is crucial that you outline appropriate employee behavior, both in terms of the individual and the group. This should cover everything from dress code to email etiquette, vacation days, and much more. Provide Continuing Training: The working world is constantly evolving, especially with the continued development of technology. It is important to ensure that your employees are well-equipped to continuously adapt. This means providing opportunities for advanced training. Get Out of Their Way: When you micromanage, you can actually hinder teamwork and halt the development of your group. When you micromanage, fail to let your employees think for themselves. You fail to let them problem solve. You fail to let them work as a group to accomplish business goals. Team Building: The objective of team building is improving teamwork to increase group cohesion and effectiveness. This can be done either onsite or offsite, but should always be handled by a trained professional to ensure maximum effectiveness. Terrapin Adventures is conveniently located in Howard County, Maryland, between Baltimore and Washington DC. 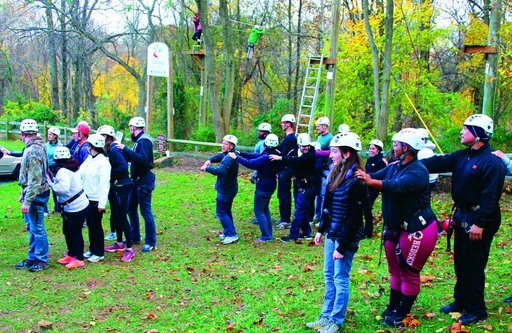 Our custom onsite and offsite team building solutions are presented in a fun and creative way that will help break down barriers, foster communication and cohesion, and help stretch the limits of your team. As the two people walk along the wire or the wooden plank, they have to start leaning on each other for support. It is the rest of the group’s job to help navigate and ensure neither team member falls off the wire or plank. Lessons Learned: This challenge requires two people to work closely while the rest of the team works to support them. How will your team handle this challenge? Will they work together or will they struggle to work as a cohesive team? Who will take on leadership roles? The Wild Woozy requires a tremendous amount of trust and teamwork. The Wild Woozy is just one example of the many different team building exercises that Terrapin Adventures uses to help your team reach their full potential. This entry was posted on Wednesday, April 22nd, 2015 at 12:10 pm. Both comments and pings are currently closed.